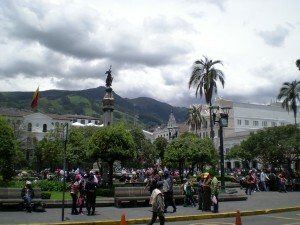 Saturday, Central Quito, lots of touristas taking pictures of other touristas. A deep and manly ‘hurrah’ is in order, since with this visit to Ecuador, we have now been to six of the seven continents. On the planet Earth, in case your were wondering, as I sometimes do. Granted, our exploits pale in contrast to the typical Nineteenth century English exploratory expedition where sixty percent of the participants died, and the rest went insane and then died, but it’s an accomplishment for us. Quito is very green, like unnaturally green. Coming from Colorado, still deep in the depths of winter, the predominating colors are brown and white. And even in the middle of the monsoon season, where we get thunder storms every afternoon, it never gets this green. So the green is a nice change. Ecuadorian construction techniques appear to rely heavily on concrete blocks. Everything, and I mean everything is built with concrete blocks. The concrete block industry has to be something like half the Ecuadorian economy. You know what’s really cool? We flew four hours from Miami and we were still in the same time zone. That literally never happens to us. Since we’re in the middle of the country (kinda) we always fly east or west with the attendant jet lag. Here we get a four hour trip without jet lag. Unheard of! I’m not saying there’s no spicy food in Ecuador. I’m just saying we didn’t sample any spicy food in Ecuador. Now if you have a hankering for a diet heavy with cheese, corn and potatoes, you’re all set. If, on the other hand, you were raised on a solid diet of Mexican and Cajun food, or fondly wished you were, by Day 3 you’ll start thinking about asking for the Tabasco sauce. But you won’t, because you don’t want to give offense to the Ecuadorians. By Day 6 you say the hell with it, give into the Ugly American archetype, and start dousing everything in hot sauce. On the other hand, they have breakfast tamales, and Mary thought this was one of the most brilliant culinary concepts in the world. We went and visited the monument that denotes the equatorial line, primarily because that’s where the tour bus went and we were stuck on it. And as it turns out, apparently the actual real, honest-to-God equator is a few hundred yards away from the monument, so we weren’t really straddling the equator when we took those lame – ‘look we’re standing in the North and South hemispheres at the same time!’ photos.